and Darrell Webster, Snr Technology Strategist at BitTitan. Before I begin a recap of the interview, I want to draw your attention to the Microsoft Teams Ask Me Anything event hosted on the Microsoft Tech Community. There is already a lot of discussion in the Microsoft Teams space of the Tech Community. Product Managers from Microsoft are active there, answering and asking questions. But the AMA will be an hour long, fast paced session with a number of the Microsoft Teams team answering questions. The great thing about holding the AMA in the Tech Community is that the conversation will continue long after the event. Our Microsoft Teams product team is ready to answer your #MSTeams questions! Save the date. It has been said that the preview of Microsoft Teams has been one of the more successful previews to come out of Office 365. Microsoft had a few Beta customers earlier on. Then in November, any company could access the preview. It was already very functional and this was key to its success with early adopters. 50,000 Office 365 customers turned it on and started to use Microsoft Teams. Enthusiastic previewers submitted over 800 new ideas on UserVoice. 621 conversation threads have been started by 6428 Microsoft Tech Community members who have subscribed to the Microsoft Teams space. This has “broken new ground” in how Microsoft reach out to IT Pros and end users in a preview. Microsoft Teams is available now in Office 365 for the Business, Business Essentials, Enterprise plans (excluding Kiosk). Microsoft Teams is coming to EDU, though very little can be said about the road map in this sector. Some schools are using Microsoft Teams in private preview. But no other details or dates have been announced. Even before the date of General Availability (GA), new features and changes were turning up in Microsoft Teams and Office 365. The Teams tile made a brief appearance and was quickly removed. Some of the features we discussed with Dan were available a few days before GA. Timing the release of features into Cloud based software continues to be a challenge. Microsoft Teams leverages several Office 365 services. To make sure features were available at the same time on the day, some had to appear earlier. Rapid development and response to feedback has brought 100 new features since preview and many more are in the pipeline. New email integration means email can be sent to an address for a channel. The email content will create a new post in the channel conversations. The first few sentences of the email and any attachment will be uploaded to Files. If the email has a lot of text, the whole email will be attached as an EML and can be downloaded to review. Dan said more email and Outlook integration is coming. At Preview, teams had a limit of 600 members. The team membership limit has been extended to 999 members. We asked Dan later in the interview what the conversation volume and pace is like for large teams. The Teams mobile client can make audio calls in 1-to-1 chat. I’ll be looking for meeting participation from the mobile client, much like the Skype for Business client. Though there is no mention of this on a roadmap. New tabs are available from Microsoft Partners developing for Teams. The tabs offer a deeper integration than a Connector. For example, in the Zendesk tab choose a view of the tickets in a queue. A growing list of Connectors have brought a new way to search and manage them and associated accounts. More tabs are coming from development partners. Bots can now be used with channels, rather than just in 1-on-1 chat. Learn more about integrating your app into teams in the Office Dev Center. The privacy of Teams can be changed to public or private. This means within the organization, a public team can be discovered and joined. The Microsoft Graph will suggest Teams based on the people you work with and your activity. Guest access is targeted for June this year. Microsoft wants to provide business partners, company to company and individual Guest access. The way we work continues to include people from outside our organizations. It’s exciting to think of how Microsoft Teams will improve collaboration and natively integrate with other Office 365 services and Office applications. Loryan asked whether there will be an increasing convergence between Skype for Business and Teams. Dan explained that the two products have similar but different uses. Teams is focused on high velocity communication and collaboration. The real-time nature of chat can be further escalated to a call or small meeting with video on by default. Whereas Skype for Business is the robust workload, offering larger online meetings, broadcast and other extensibility points such as PSTN calling. Those organizations who have begun using Microsoft Teams are also increasing the adoption of other Office 365 services. With chat in the middle, SharePoint and Office Online applications are being used more. Alistair raised a good point saying that Microsoft Teams “are beginning to be seen as a new front-end for SharePoint.” Rather than being taken out of Office applications, having to open your web browser to find a file, Teams bring the files into the application. Within Teams you engage with people through conversation, calls, meetings and work objects from your organization, alongside each other. That’s not to say there isn’t a need for an Intranet. I think that would be a good topic for another live stream and we’ll have to get Alistair back on to join that discussion. A lot of work has been put into helping make Microsoft Teams more accessible to people with visual impairment. There is a new high contrast theme and Screen readers are supported by elements having the appropriate tagging, so you can navigate and work with Teams. Dan is looking to get more feedback from customers using these new accessibility features in Teams. Organizations have a responsibility to ensure that communication is stored, searchable and retrievable for legal and compliance purposes. Sometimes when services have been released in preview, the data is not easily searchable and cannot be retained for a defined period. As far as documents are concerned, the files in Microsoft Teams are under the same compliance capabilities of SharePoint Online. 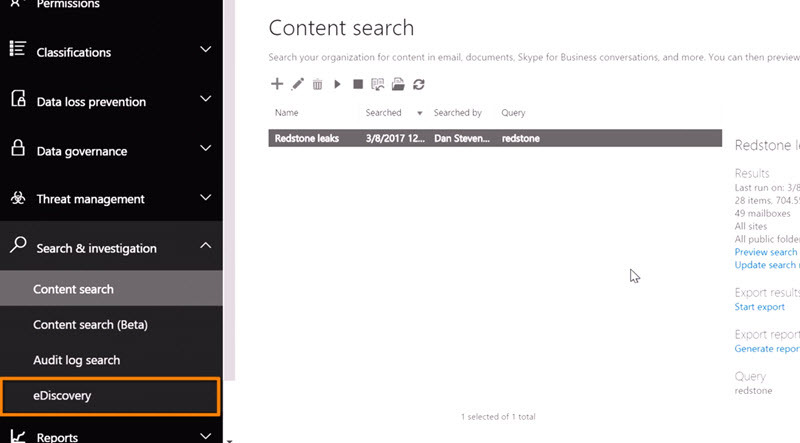 Dan confirmed the new Compliance Content Search feature in his Microsoft Mechanics video “Microsoft Teams: New Features Released at General Availability.” Messages in private chat or in team are available for search, ediscovery and legal hold. He says it was critical to have at GA. There’s also a new Audit log search to list when teams are created, modified, and deleted. Sonia emphasised the importance of compliance and Cloud services. Customers considering Cloud, compliance is a central concern. She also brought up that some customers think there should be a moderation feature in Teams conversation. But she thinks there’s more of a business cultural problem if there’s a need to moderate communication. How does Microsoft use Teams? Dan gave some insights into a team at Microsoft with 650 members. We asked what it was like having a conversation with up to 650 people. Dan said that key is to use channels. The Team forms rules around use of General channel and when it’s appropriate to @mention the whole team. This is much like sending an email to the All Company Distribution List. Or posting to the All Network Yammer feed. In Dan’s example, they use around 60 channels in the team and most communication happens in the channels. It’s very open. The channel model and mentioning feature makes the channel still feel like you’re working closely within your team, from wherever you are. I’d like to thank Dan, Sonia, Alistair and Loryan for joining us in an informative interview. Make sure you join the Microsoft Teams AMA in the Tech Community on March 22, 9-10am Pacific Time. SuccesswithTeams.com – Planning and Adoption workshop guidance.